Talk about a changeling! 'Blue Paradise' will change colour before your eyes each day its in bloom. The true blue blooms will deepen to violet under the heat of the midday sun and fade back to their original colour again by nightfall. 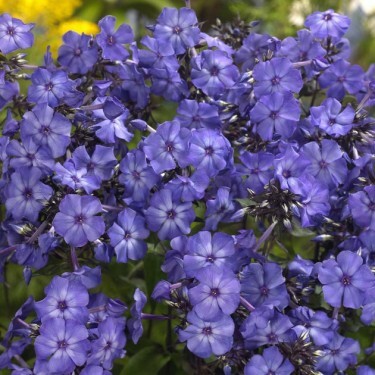 Garden Phlox is attractive to hummingbirds and butterflies. An old fashioned favourite, Phlox can be used in formal borders and is often seen in cottage gardens. It mixes well with other perennials and provides long summer bloom. Tall, border phlox, with their fragrant flowers in large trusses on sturdy stems, are particular favourites. Phlox can be susceptible to mildew so wherever possible, water from below and provide good air circulation. All species of Phlox are native to North America.